Vyborg is an amazing town. The most real medieval town with all attributes – the only real European knight’s castle survived in Russia, a market square, a town hall, narrow streets, towers… And all of them are real, not built for tourists. 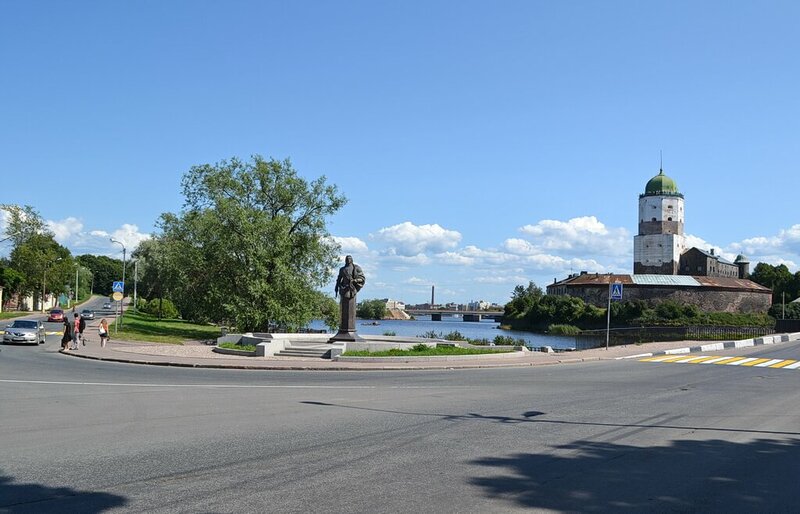 From this post you’ll learn the most convenient way to get to Vyborg from St. Petersburg and how to better navigate in it. 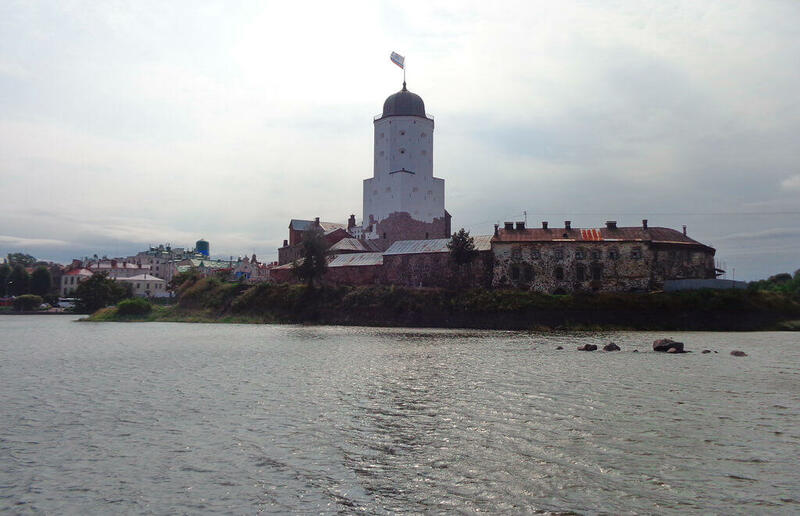 Apart from a private car, you can use either a bus or an electric train to get to Vyborg. Information on this page has been updated in January 2019. Regular buses depart from the Parnas coach terminal which is near Parnas subway station, located in the Northern part of St. Petersburg. The bus schedule and cost of tickets should be specified by phone: +7 812 677 15 07. In January 2019, a one-way ticket costs from 170 to 260 roubles. Buses run frequently, about every hour or two, sometimes every forty minutes. The first bus leaves at 07.40, the last – at 20.00, time en route varies from two to two and a half hours. 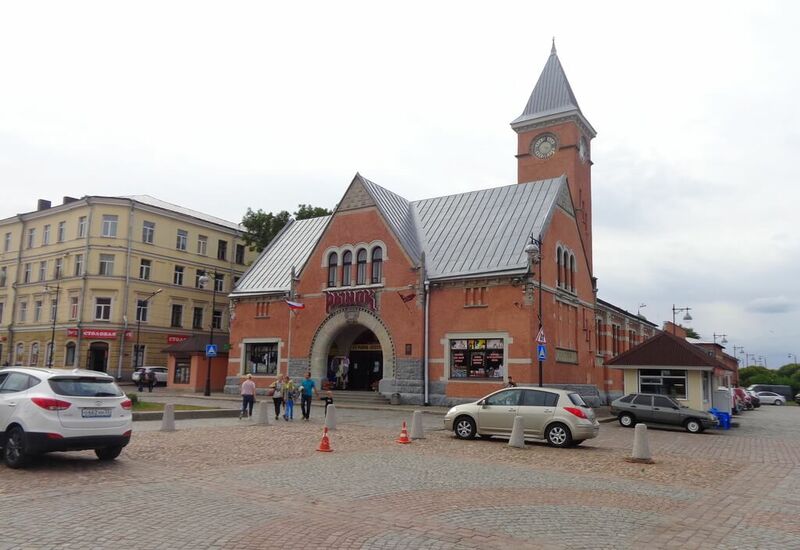 To find the Parnas bus station, you should exit the Parnas metro station, turn diagonally to the left, pass along a small car park, behind which turn 90° left again and here’s a small building – the ticket office. 2-2.5 hours is the estimated time en route. Actually, the travel time can increase by 1-2 hours, especially on Fridays and Sundays in summer, when people go to the countryside for a weekend or turn back. 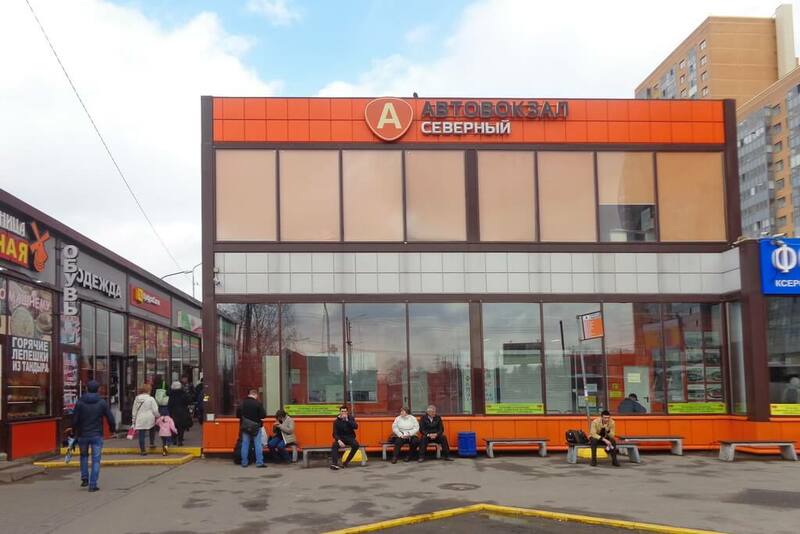 Also, it is possible to take a bus to Vyborg at the Severny bus station (Murino), which is near the exit from the Devyatkino subway station. 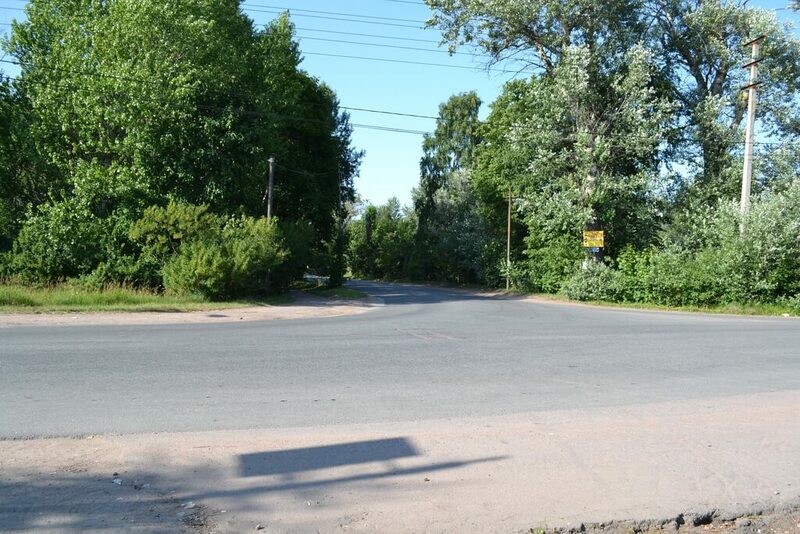 You need bus №810 St. Petersburg – Svetogorsk, there are four departures – two in the morning and two in the evening. Though, it is more convenient, reliable, and faster to depart from the Parnas station. Attention! 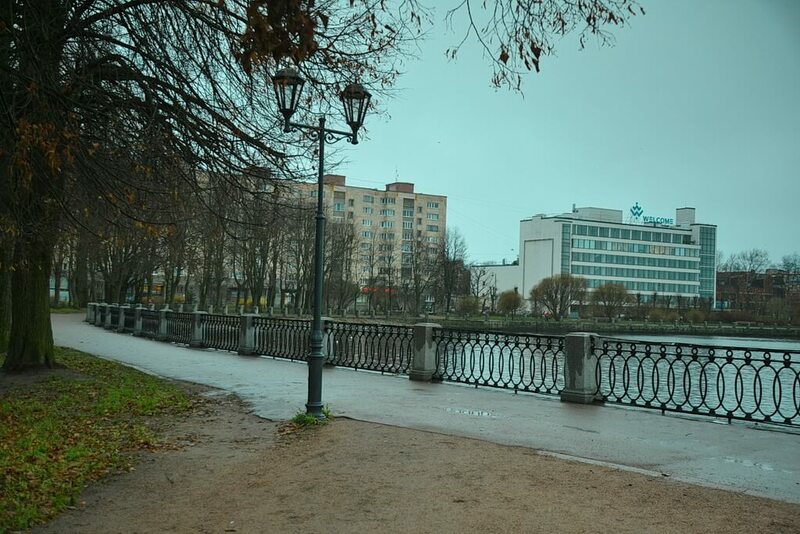 No buses to Vyborg depart from the main St. Petersburg bus station at 36, Obvodny Canal. The best way to get to Vyborg, in our opinion, is by rail. Trains depart from the Finlyandsky vokzal railway station (Ploschad’ Lenina subway station). The train timetable is available here (in Russian). On September 2, 2015, the Lastochka high-speed electric train was launched. This is the fastest option, but not always the most comfortable: at weekends during high season, Lastochka railcars are overcrowded, so a lot of people have to stand during the journey. Yes, this is an important detail – there is no specific seat number in a ticket. Other electric trains are less popular, therefore, less crowded. Starting from October 22, 2018, Lastochka leaves St. Petersburg for Vyborg six times a weekday (and the same number of arrivals back to St. Petersburg) from morning to evening, on weekends and holidays — seven times. The travel time is only 1 hour 15 minutes. A one-way ticket costs 342 roubles in 2019. In addition, there are ordinary «slow» electric trains, which are not much cheaper (303 roubles), their time en route is 2 hours 12-16 minutes. 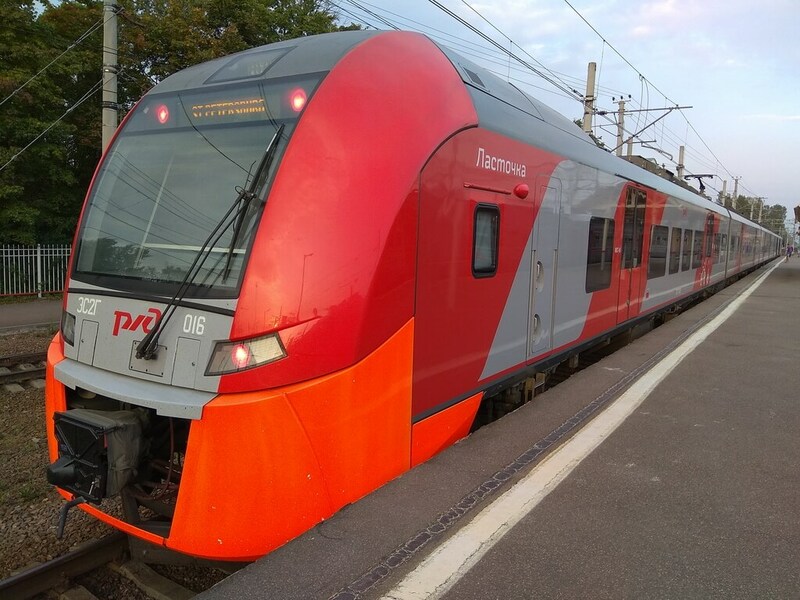 — at 20.44 you depart from the Vyborg railway station by the Lastochka train and arrive in St. Petersburg at 21.59; or at 20.53 and return to St. Petersburg at 23.08 by an ordinary electric train. On weekdays, the schedule looks almost the same, but with a slight shift in time. Note: on weekends / holidays it’s recommended to arrive to the Finlyandsky vokzal railway station a half an hour before the departure of the train. 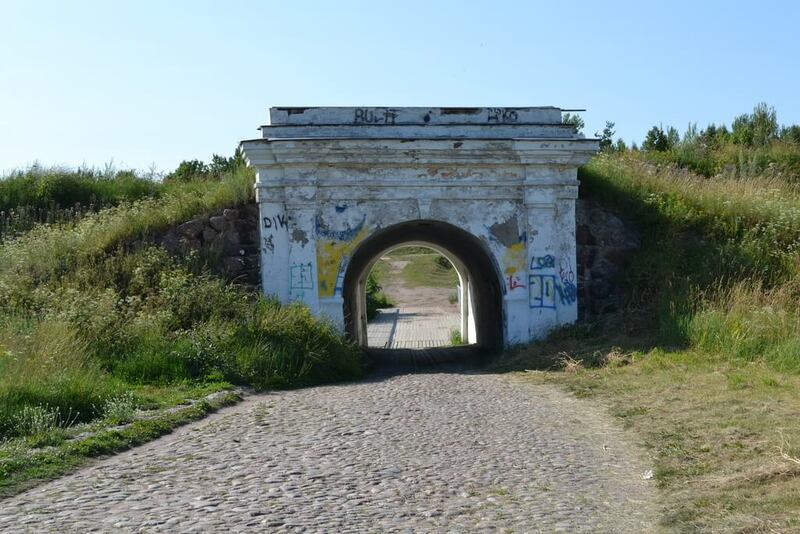 There are queues of vacationers, tourists and lovers of Vyborg (lots of them!) at the vending machines and ticket offices, especially in spring, summer and autumn, so it is quite possible to be late for your train. — the Allegro high speed train going between St. Petersburg and Helsinki also makes a stop in Vyborg, but it’s for technical purposes only. You cannot by a ticket from St. Petersburg to Vyborg by Allegro. 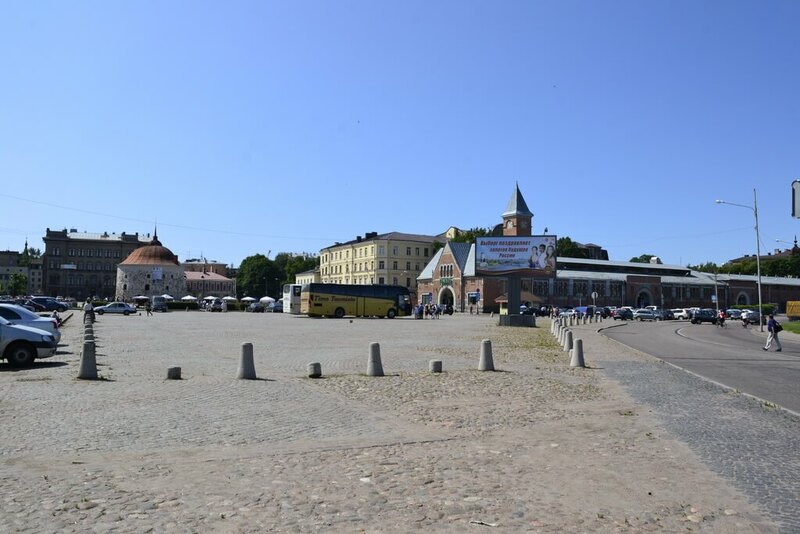 A standard route in Vyborg begins from the railway station (the bus station) through the Market square to the Vyborg castle, then to the Monrepos Park, then in the opposite direction on exactly the same route, or through the main square. We’ll take this route. Coming out of the railway station, you will face a large building (in the center) and two streets, bending it. 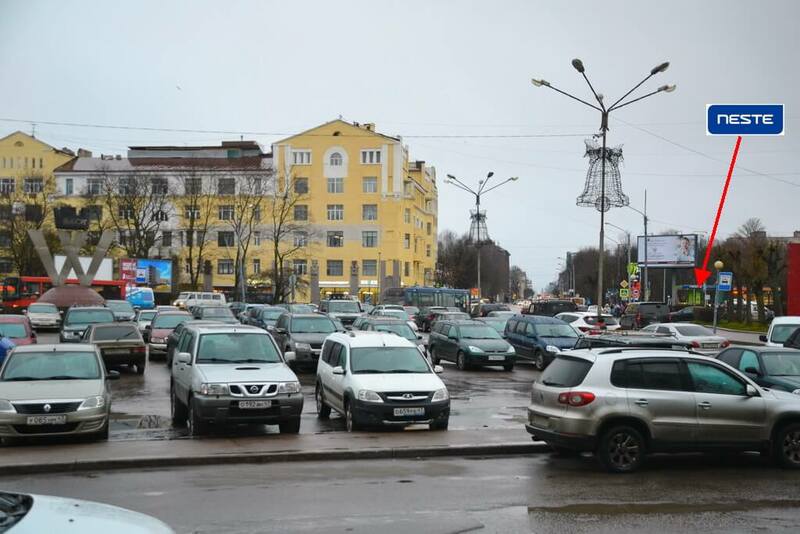 You need the street on the right – Leningradsky Prospect. 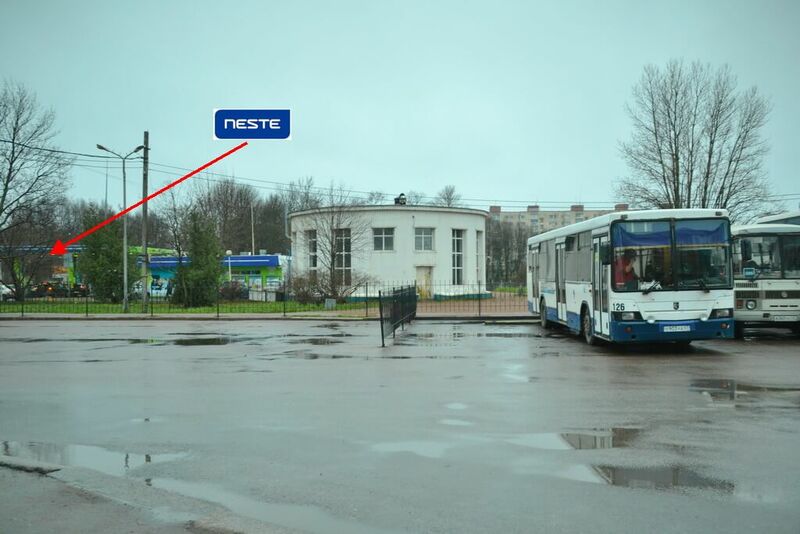 Focus on the Neste petrol station. If you get off the bus at the bus station, you will see another building, looking like an outbuilding. You just need to pass along it. 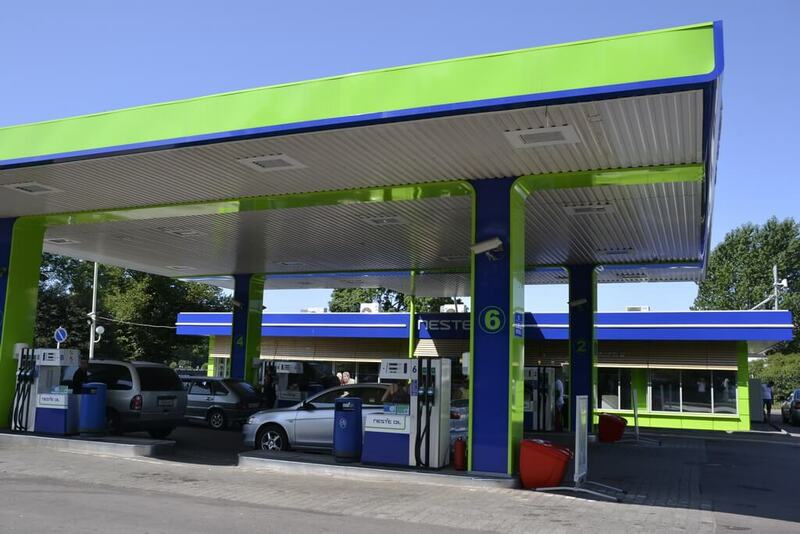 After a little walk along Leningradsky Prospekt, you will see the Neste petrol station. 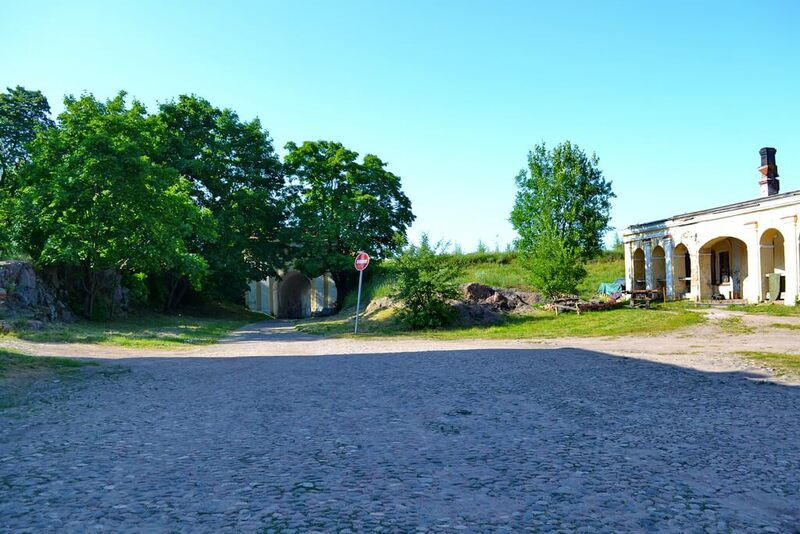 Behind the petrol station, just 50 meters away, is the embankment of the Gulf of Salakka Lahti. You should go along it in the direction opposite to the railway station. 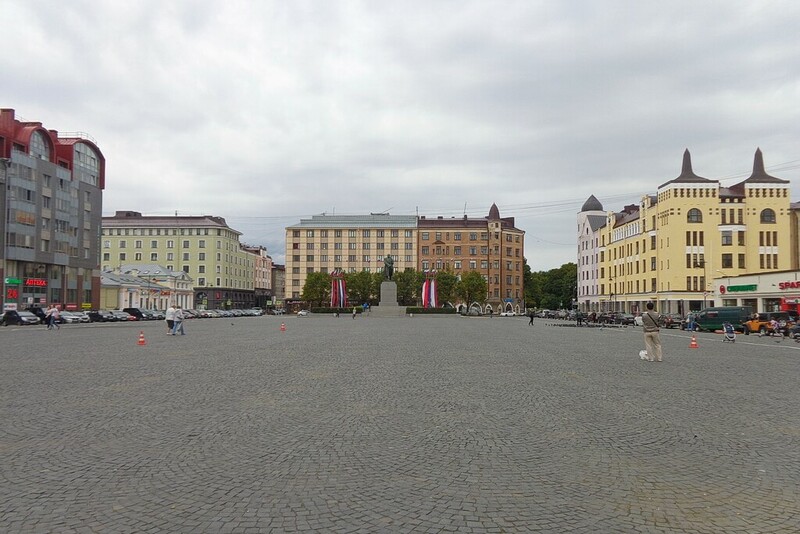 On the left, you will see soon the Market square and the market building with clock tower, which is worth paying attention to. Returning to the embankment, continue walking in the same direction to the castle, the tower of which you are likely to have noticed earlier. A must-see is the observation site of the castle. Attention: in the winter 2018, the castle tower is hidden in the scaffolding; the climb to the famous observation site is not possible. It is promised to open by the end of 2018. UPDATE 2019: it’s opened. In the fortress, you can dabble in archery (six shots for 100 roubles) and visit different exhibitions, for example, the underwater archeology exposition, where you’ll see cannonballs, cannons, and equipment of warships raised from the sea bottom. As a reminder, Russian Tsar Peter I won the Battle of Gangut (between the Swedish Navy and Imperial Russian Navy) in the waters of the Baltic Sea. When you come out of the castle on the bridge, turn right, moving in the opposite direction from the railway station. Now we go to the Monrepos Park. Two hundred meters further, you will find a monument to General Admiral Fyodor Apraksin. Look at the building in the background. Pass the building from its right side and get on the path that leads through the cute arches. Go down this road, and in about ten minutes you’ll be at the Monrepos Park. Your schedule: 40-50 minutes to walk from the railway station to the embankment and the castle, spending 25 minutes at the Market square. The castle must take 1.5 – 2 hours, a lot depends on how many people will be on the observation site. An unhurried walk from the castle to Monrepos takes another 20-30 minutes. The way back from Monrepos lies through the castle, that is, you go backwards exactly the same route, but after the castle, when you get off the bridge to the ground, there are options. 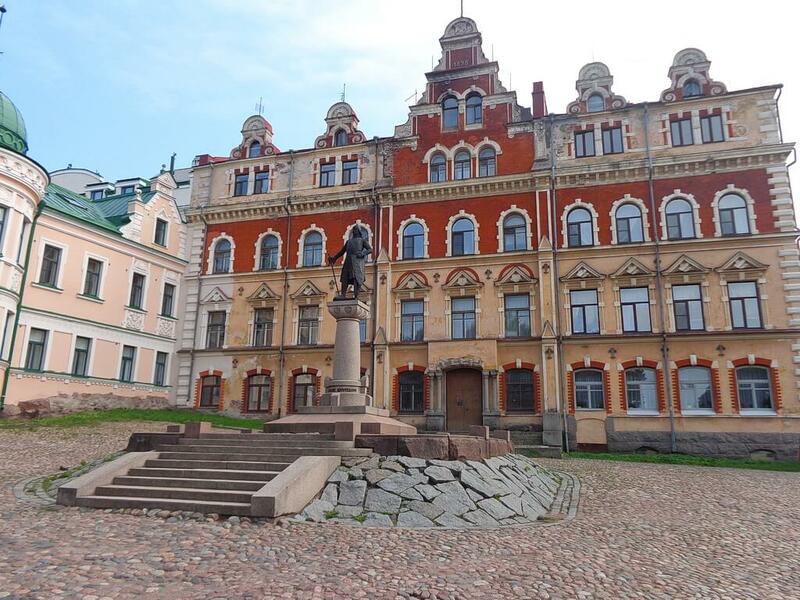 Look at this photo with the monument to Torgils Knutsson, the founder of the Vyborg castle. The monument is located on the Town Hall Square opposite the castle. You can go to the left from it, along the embankment, and return to the station following the same route. Or you can pass it from the right side and, walking down the Krepostnaya (Fortress) street, through a network of small cobbled streets and alleys reach the main square – the Red Square, which serves as a shopping and cultural center of the city. 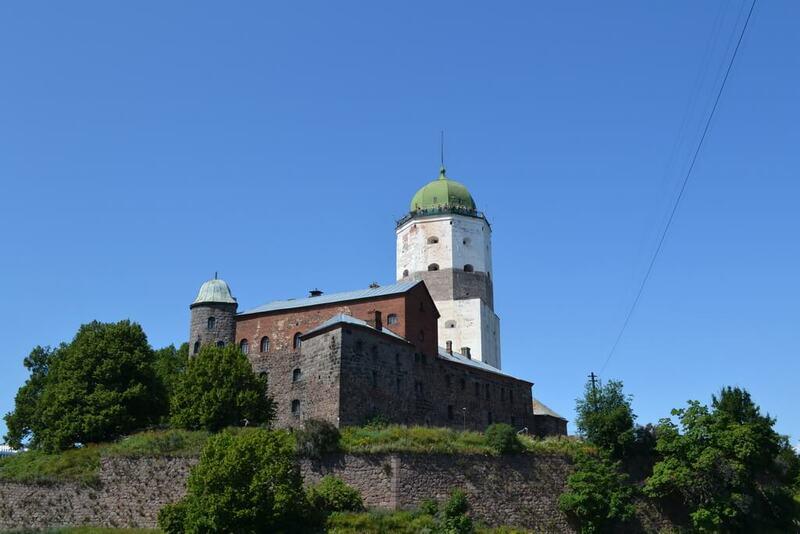 Read also our post on excursions in Vyborg in English.